In the early morning of Thursday, November 8, 2018, the first sparks of what would become the deadliest and most destructive wildfire in California’s history ignited in a wooded area near the town of Pulga. Less than two hours later, the sky around Paradise – about seven miles Southwest – turned dark and hazy as the flames suddenly descended on the town with awesome speed. Harrowing video captured by the fleeing residents depicts a world on fire. Embers litter the roads while the flames raging in all directions offer the only light against the pitch black sky. “Just breath,” Michelle Simmons told her children in the back seat, trying to conceal her panic. But with little or no warning given to residents, others, like 66-year-old Vicky Taft, were left behind as the entire town was engulfed. From Paradise, the fire spread through the rest of Butte County, burning an area the size of a football field every second. 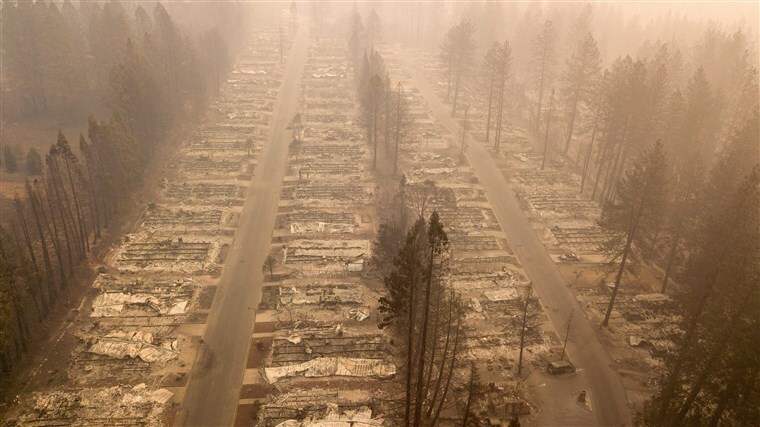 When it was finally contained about a month later, the Camp Fire – as it came to be known – had scorched some 153,000 acres of land, destroyed 14,000 buildings, and left at least 85 people dead. Though an official investigation is ongoing, Pacific Gas and Electric, the largest utility company in the country, has admitted it’s “probable” that its faulty infrastructure started the fire. An investor-owned company, PG&E is one of the few public utility companies in the United States that is managed privately and run for profit. Now, with the company in bankruptcy and facing billions of dollars in potential liabilities, residents in California are beginning to debate whether a profit-driven corporation like PG&E can be trusted to protect public safety going forward. If PG&E is found responsible for the Camp Fire, it would not be the first time a failure of its equipment has resulted in disaster. The company remains under criminal probation after it was convicted on charges stemming from a 2010 gas line explosion under the city of San Bruno, which sent flames 1,000 feet into the air. Eight people were killed in the blast and 38 homes were leveled. Nearly six years after the explosion, a jury found the company guilty of knowingly failing to inspect and test its lines after the state showed PG&E was running gas through the aging lines at excessive pressures. The company was also convicted on one count of obstruction of justice after jurors concluded its executives lied to and mislead investigators. Investigators have concluded that PG&E’s equipment was also responsible for a series of fires that ravaged Northern California in 2017, killing 43 people and destroying more than 14,000 homes. “It’s difficult to overstate the unpopularity of PG&E in California,” Jared Ellias, a bankruptcy expert and professor at the University of California’s Hastings College of Law, told The Globe Post. And while PG&E has traditionally wielded significant political power in California’s state government, there are signs that officials’ patience is wearing thin. “Time and again, PG&E has broken the public trust and its responsibilities to ratepayers, wildfire victims and employees,” Nathan Click, a spokesman for Governor Gavin Newsom, said in a statement this month. On Friday, Newsom himself had some harsh words for the company during a press conference addressing its bankruptcy. In recent years, the state government has worked closely with PG&E and has been receptive to its input, according to State Senator Jerry Hill. “Frankly, now, I don’t think anyone in this building gives a darn about what they need anymore,” he said. In a poll released earlier this month, a majority of San Francisco residents said they’re in favor of the city taking over control of PG&E’s energy infrastructure – a proposal that’s now being debated seriously following the Camp Fire and the company’s decline into bankruptcy. During a March press conference, Newsom dismissed a question about bringing PG&E under public control, saying he’s focused on providing more immediate relief to fire victims. 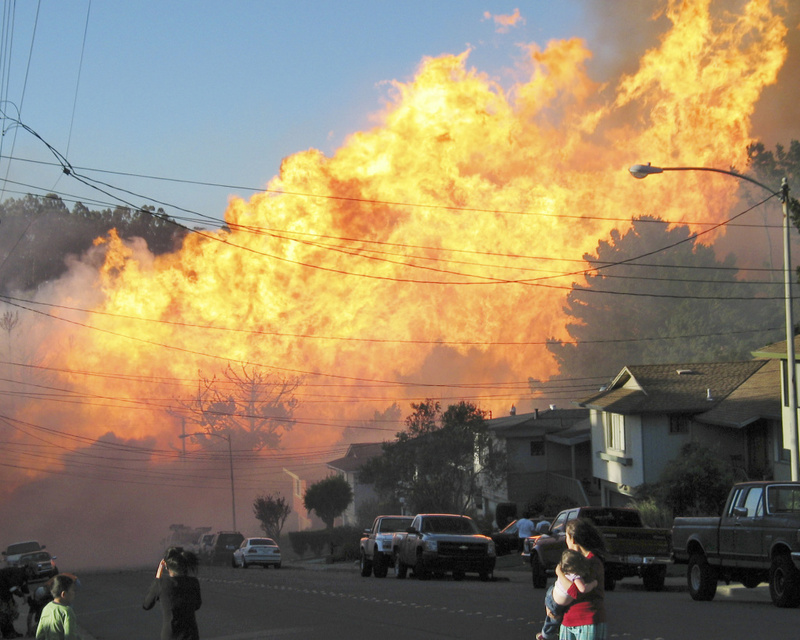 A large fire burns in San Bruno, California following the 2010 gas line explosion. Photo: AP, Michael Sah. “If PG&E is not capable of providing safe service at a reasonable price, we need to find a new provider that can,” he said. To some, the company’s failure to prevent disasters is not in itself surprising. 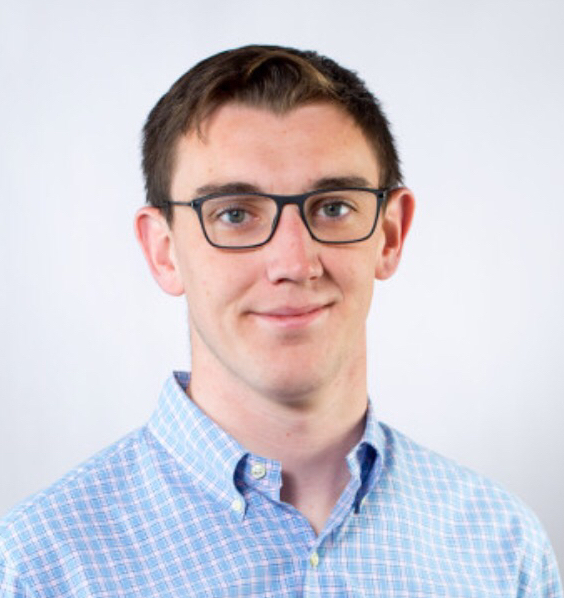 David Griscom, a writer and economics commentator with the popular left-wing podcast The Michael Brooks Show, argued that there’s an inherent tension between PG&E pursuing profit and protecting public safety. Griscom’s concerns were echoed by Mindy Spatt, a spokesperson for TURN. In theory, regulation is supposed to mitigate the tension between private profit and the public interest. Though PG&E is investor-owned, the utility is only semi-private as it is overseen by the state’s Public Utilities Commission, which has the power to veto rate-hikes and other actions proposed by the board. But according to Griscom, the failure of the PUC to prevent the recent string of disasters caused by the company’s equipment is evidence that regulation alone is not sufficient to protect the public. Further, evidence made public in the wake of the 2010 San Bruno explosion demonstrated a cozy relationship between the company and officials tasked with regulating it. In 2017, PG&E agreed to pay $86 million in penalties over allegations of improper backdoor communications with PUC officials as part of a scandal that ultimately led to the resignation of several regulators. Following the explosion, the city of San Bruno forced PG&E to hand over thousands of emails between its executives and PUC members. In a second email, former commission president Michael Peevey described discussing business with PG&E’s vice president of regulatory affairs over some “good Pinot” at a Sonoma County resort. But PG&E’s efforts to influence policy are not all so nefarious. In 2018, the company spent over $10 million lobbying officials and more than $1 million on campaign contributions – including $200,000 to Newsom’s campaign. With the company – and public utilities in California more broadly – facing an uncertain future, early evidence seems to suggest that PG&E maintains more political leverage than the activists and members of the public who want to see systemic reform. Despite his criticisms of the company, Newsom on Friday proposed changing California’s strict liability laws that hold utilities responsible for fires caused by their equipment – a reform PG&E has long lobbied for. The proposal came as part of the announcement of a “strike force” the governor has tasked with making “big changes” to the way the way utilities operate in the state in the wake of the Camp Fire, particularly as climate scientists warn that wildfires are likely to grow more intense and frequent in the years to come. 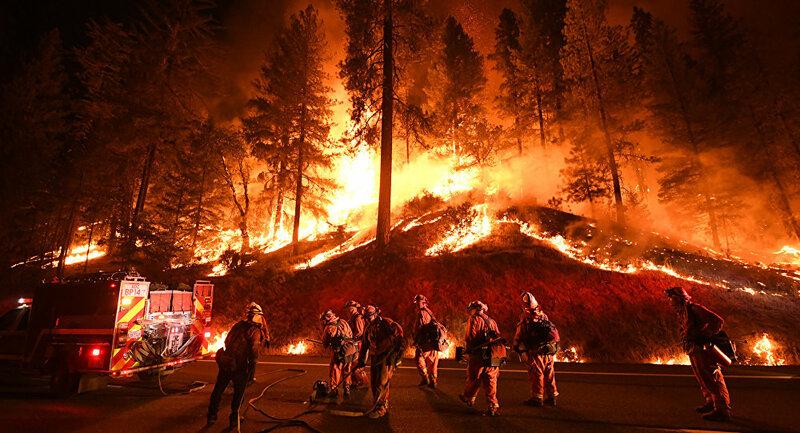 Because of the increased consequences of safety failures associated with climate change, PG&E and state officials have raised concerns that utility companies will not be able to remain economically viable under the current liability laws. But recent internal moves suggest PG&E executives and Wall Street investors are not so concerned with the company’s long term future. According to Ellias, the continued interest in the company from major investors is evidence that they expect they will still have a “power giant” when the dust settles. “The most likely outcome is that what comes out of this bankruptcy is something that looks very similar to the PG&E that went into the bankruptcy,” he said. Serving some 16 million customers in Northern California, PG&E enjoys a “captive market,” meaning there is little or no alternative competition for ratepayers to turn to. “For most of us it’s pretty much PG&E or light a candle,” Ellias said. And though the company has claimed that is ready and willing to change after the Camp Fire, critics are highly skeptical.